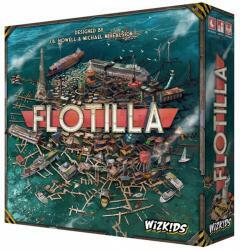 WizKids imagines a world where the Castle Bravo nuclear test of 1954 obliterated the Bikini Atoll and ruptured the Earth’s mantle all the way to the core in Flotilla. In the strategy game designed by J.B. Howell and Michael Mihealsick, the U.S. experiment with nuclear weapons went horribly awry, superheating the Earth’s oceans, melting the polar icecaps, and flooding the planet. Now, survivors eke out a living on floating cities, as they scavenge for resources. Players seek to become the most influential fleet captain and lead humanity into a new age by building their resources, salvaging ruins, and adding to their crew. Players begin the game as "sinksiders," exploring the ocean for resources. But they attempt to become "skysiders," adding their gains to the massive flotilla humanity has assembled in the wake of the disaster. The game includes boards for the ocean and the guilds that rule the flotilla, as well as individual player boards, tiles for survivors, crew, and objectives, artifact cards, dice, and discs. It is designed for two to five players aged 14+ and plays in about 90 minutes. MSRP is $64.99. Flotilla is scheduled for delivery in October.